2017 is shaping up to be an exceptional year for Whitney Rose. A tantalisingly short but rather good EP release at the start of the year was followed by an extensive tour that saw a fair few dates in Europe and the UK. It was in fact the Nottingham gig back in May, which showed Whitney and her band in a wider focus. Now the calendar year is about to be crowned with the unveiling of a brand new full-length album titled RULE 62. Whether this is the true follow up to the EP or 2015’s HEARTBREAKER OF THE YEAR is immaterial, but a renewed acquaintance with Raul Malo, who was a key component on the latter, has paid dividends on the new album. First and foremost, this is a record of the highest quality. It mixes incisive song writing with a throwback sound that retains a vibrancy and freshness. Pooling a classic soulful pop feel with traditional country is an immediate winning formula, especially buoyed when you have some top notch players in harness within a Nashville studio. Of course, the core talent is Whitney’s intuitive knack of creating a great song and this album houses plenty. The title aroused an interest and is based on a notion of not taking yourself too seriously. However, alternative connotations sprang up from the distinctive album cover with the number framed within a road sign. A little investigation reveals that H-Way 62 links Whitney’s home nation of Canada with the Texas base where she has made her name. There is also a sporadic road theme throughout the eleven tracks alongside the continual laments about lost, failed and doomed love. Anyhow, let’s put loose associations on one side for a moment and concentration on the treasures, which make this album stand out. Where better to start than the opening line of the first track with Whitney explicitly calling out the sentiment of the title ‘I Don’t Want Half (I Just Want Out)’.Straight to the point song writing is an inherent appeal of country music. Throw in some fiddle and steel interludes into this opening piece and you have the genre at its most primal. Three quarters of an hour later the listener can finally take a breather with the revenge pop country piece ‘Time to Cry’ acting as a charismatic closer, complete with scintillating guitar parts and a infectious chorus to glue the components of a top song. By the way, any references to pop need not excite fans of the Nashville mainstream variety. This is pure hazy fuelled nostalgia filled stuff best exemplified by the frustrations purveyed in ‘You’re a Mess’. Two contrasting tracks have seeped out in the run up to the album release. ‘Can’t Stop Shakin’’ (complete with the unmistakeable country apostrophe) is the major soulful inclusion on the record with horns and keys illuminating it as a hip-moving dance track. ‘Arizona’ is less soulful but still a lively spritely stomper and induces immediate lyrical inferences when you partake in the essential act of digesting Whitney’s writing. Is the title to be taken literally or a metaphor for a better place to be? Great songs can provoke thought as much as act as a message piece. While the last track resides within the upper echelons of the record, the true heights surface in a trio of compositions running consecutively in the second half. The filling of this gourmet sandwich is the imperious ‘Trucker’s Funeral’; an exemplary display of fine story song writing elevating a quirky notion, while presenting some of the romantic escapist aspects of Americana music to those viewing from afar. The trio starts with the accordion inspired ‘Tied to the Wheel’ and a philosophical perception of an activity that steers our lives. Superbly summed up in the line "Am I drivin' it or is it drivin' me? ".‘Wake Up in Wyoming’ is another piece of heartfelt Americana taking in the travails of touring, alongside shoring up the road content. Two of the remaining three tracks show the Raul Malo influence. The duet vocals add strength to ‘You Don’t Scare Me’ and back up the sentiment of the song. ‘Better to My Baby’ possesses a Tex-Mex pop feel and could quite conceivably be a track lifted from a Mavericks or Raul Malo album. It is tough on ‘You Never Cross My Mind’ to be the last track referred to especially as if you drill down deep into the lyrics, a clever dose of irony pours out. It goes a long way to sealing what a well-written album this is from beginning to end. To the extent that the excellent SOUTH TEXAS SUITE EP was frustratingly short, RULE 62 is majestically complete. 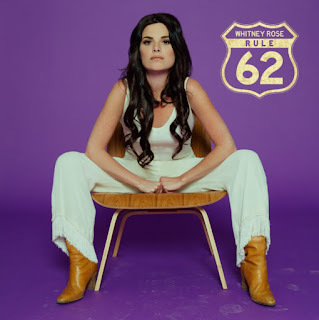 While Whitney Rose is not a powerhouse vocalist, the way it is utilised across the record is effective. There is a little synergy with Margo Price in this respect. The influences of her collaborators have also been absorbed wonderfully. RULE 62 is an album that matters and will reign supreme in many record collections for a long time.